A play on texture and length, Anh mixes long and sleek with an ultrashort buzz for a multidimensional and visually playful combination. Meticulously detailed, this undercut has a dramatic, V-Shaped back that is hidden under the top layer, only visible when the hair is up. 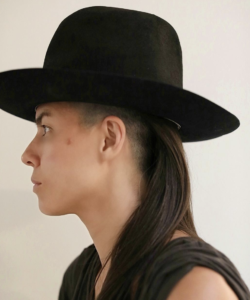 This look can be played to be more dramatic or subtle, its subtlety demonstrated here with just a peek of the shaved side visible underneath a wide brimmed hat. Playing with length and texture works dynamically for a dark, single-toned brunette shade of hair, giving it more dimension and visual interest.